We are proud to shine a light on the work of 2015 Montana Teacher of the Year Craig Beals from Billings, MT. A Chemistry teacher at Billings Senior High School, Craig believes that strong relationships with his students are the key to successful teaching. Learn more about the innovative work Craig is doing in our on-air spot about Craig. Do you know an innovative teacher we need to feature on MontanaPBS? Contact Nikki Vradenburg at Nikki@MontanaPBS.org for more information. MontanaPBS is one of five stations in rural areas across the U.S. that are part of the PBS Teacher Community Program. This pilot initiative aims to examine how teachers are using technology and digital media to enhance learning for students. The project is also investigating how local stations like MontanaPBS can support their work through on-going and embedded professional development. Nikki Vradenburg is a former classroom teacher and is the Teacher Ambassador for MontanaPBS. She works with schools in Livingston, Three Forks and Amsterdam, to provide professional development for teachers that is localized and specific to their needs. She also conducts training for teachers throughout Montana about best practices for using digital media in the classroom. Visit the Teacher Community Program Page. PBS LearningMedia is a free resource that teachers and students can use in the classroom. Learn more. Looking to refine your teaching skills or take the next step in your career? Take advantage of professional development courses from PBS TeacherLine. Learn more. Most programs broadcast by MontanaPBS offer educators the right to record the program for use in the classroom within a defined period of time. In many cases this right is extended for one year from the date of broadcast, but in some cases may extend for the normal life of the tape. Look for the specific educational taping rights offered at the end of each program description. The period of time for these educational rights renews every time MontanaPBS rebroadcasts a specific program. Some programs also have curriculum materials for use in conjunction with the program, which generally must be purchased. 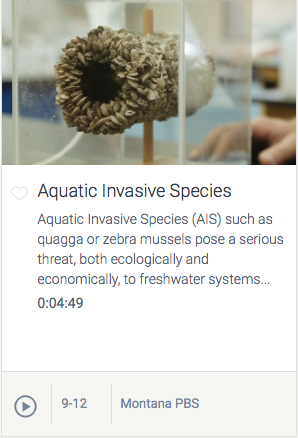 Aquatic Invasive Species (AIS) such as quagga or zebra mussels pose a serious threat, both ecologically and economically, to freshwater systems because they reproduce dramatically and can block dams, plug irrigation systems and attach to water craft in a fairly short time. Learn More.